"The complete life story of one man, were it known in every detail, would disclose practically all there is to know about syndicated gambling as a phase of organized crime in Chicago in the last quarter century. That man is Mont Tennes." So declared the Illinois Crime Survey of 1929. The man who stood at the center of Chicago gambling during the first quarter of the 20th century, and who developed a sporting news service that eventually monopolized horse racing operations throughout North America, lived here, in the mansion at 632 W. Belden Ave. (or before the 1909 street renumbering, 404 Belden) during the height of his power. Jacob Tennes was born in Chicago in 1873 to a large family with five brothers and two sisters. He was nicknamed "Mont" by his mother at a young age, and that became the only name by which the city's King of Gamblers was ever known to be called. Even as a boy, he was known to be an expert at dice and other games, and before his 20th birthday he began running his first handbook operation. His gambling expertise provided the start-up capital he used to open the Tennes Billiard Hall on Lincoln Ave., near Wrightwood Ave., which he operated along with his brothers. There he sponsored pool tournaments, in which he himself was frequently the victor. Over the next few years, Tennes gained interest in a number of other handbooks operating on the Northside, and in 1900, he began opening saloons, including one inside the Billiard Hall on Lincoln. By 1901, Tennes' name was already well known among anti-gambling advocates, and a crusade against saloons on N. Clark St. in River North focused primarily on Tennes-owned saloons. The Tribune reported that “residents of the neighborhood allege that the district fast is approaching the condition that existed in the levee” (probably a reference to Custom House Place, the city's biggest red light district at the time). On a cigar stand in front of the main room is posted a racing form, which is eagerly studied by those who enter. The ticker is behind a thin partition and the bookmaker gets information of track and odds over the telephone. The results are announced at the bar and down-stairs in the bowling alley, where many men gather....Everyone seems to have the utmost faith in the bookmaker, and gains and losses are taken from his report without a word. The book has been successful, it is believed, for ‘killings’ [large winnings by the house] are rare in Tennes’ place. Remarkably, women were among the major clients of Tennes' gambling houses, though they rarely entered the saloons, cigar shops, and even cash register shops that fronted his operations, choosing instead to call in their bets or give them to one of a team of employees who traveled around the city, taking wagers in the morning at homes and stores on races taking place in the afternoon, and settling accounts from the previous day's races. The increased interest in horse racing during the early part of the century created a business opportunity for gambling entrepreneurs, who previously focused on cards or games like roulette and faro. At the same time, off-track betting presented a serious technological problem: how to acquire quick and accurate results from the races, as the house stands to lose substantial sums if gamblers learn the outcome first. Managing and monopolizing the supply of information on tack conditions, odds, scratches, and race results became Mont Tennes' life work. Starting in 1904, Tennes began operating clearinghouses where national racing information was received by telegraph, then dispersed to handbooks throughout the city by telephone. 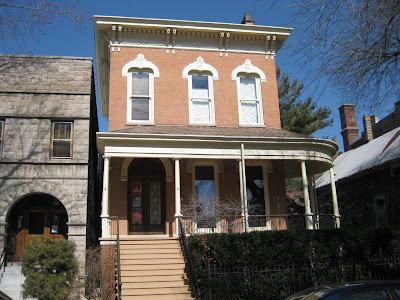 The first of these, opened in league with other major gambling figures including Tom McGinnis and "Big Jim" O'Leary, was a little cottage in Dunning at Irving Park Rd. and Narragansett, just outside Chicago city limits, where suspicious neighbors noticed two telegraph lines leading in through a kitchen window. The photo below shows a forest of telephones in one of Tennes' later clearing houses at 123 Clark St. (now 550 N. Clark). Frequenters of the place say Tennes has a pull which is strong enough to keep his handbook running in spite of the strong opposition of many people in the vicinity. The East Chicago Avenue Police Station is four blocks away, but Captain Revere’s policemen pay no attention to the poolroom. While strangers have some difficulty in placing money with the bookmaker, there is no great attempt at secrecy, and the betting goes on while chance customers come and go at the bar. Politicians, however, must satisfy their constituents if they want to keep their jobs, and so in 1903, Mayor Carter Harrison, Jr., declared open "war" on Chicago's handbooks, forcing the hand of the police. He revoked the saloon licenses of all the city's top gamblers, including Bob Motts, Andy Craig, Mushmouth Johnson, Alderman Michael "Hinky Dink" Kenna, and above all, Mont Tennes. Thus began a complex and protracted political battle between Tennes, the police force which wanted his graft, the Mayor, and citizens. In league with the police, Tennes publicly declared that, due to Mayor Harrison's order, he was finished with the gambling business, and he sold his saloon license to a "M. A. Jockum," who was actually an associate, allowing Tennes to remain in control of his bars and handbooks. At the same time, he paid the police to focus on raiding the books of his business rivals. This latter practice was one Tennes continued to employ throughout his career as he attempted to monopolize gambling in the city. At the December First Ward Ball, an annual saturnalian party and underworld soiree thrown by Aldermen Kenna and John J. Coughlin, Tennes' men handed out over $2,500 to the various politicans to help turn down the heat on his operations. Besides the police and city politicians, Tennes also faced continuous trouble from rival gamblers. While his original 1904 clearinghouse in Dunning was a partnership with Jim O'Leary, the two fell out in 1906 over the latter's success in operating the City of Traverse, a gambling boat that operated outside police jurisdiction, four miles offshore on Lake Michigan. In retaliation, Tennes threatened to start his own gambling cruise operation, the City of Midland, unless his rivals cut him in on the deal. When they refused, he sent a tug boat out to shadow the Traverse, and when it turned on its wireless service to begin receiving racing news for the sports aboard, Tennes' tugboat blasted hits fog horn, thinking this could disrupt the transmissions. Instead, the trick only caused those on shore to believe the City of Traverse was on fire, sending panic throughout the city. Some reports claim that O'Leary and his associates finally did cut Tennes in as an investor in the City of Traverse later in 1906, ending the feud. But this theory is belied by the fact that the following three years witnessed constant dynamite bombings of rival gamblers' homes and businesses in what the media dubbed the "Gamblers' War". The Gamblers' War started in June of 1907 when Mont Tennes was physically attacked on the street near his home by a man whom police initially believed to be a disgruntled loser at one of Tennes' resorts. Tennes, however, was convinced O'Leary was behind the attack in retaliation for Tennes' efforts to have O'Leary's Northwest Indiana gambling houses raided by police. In any case, the home of "Blind John" Condon, who had previously worked with Tennes, but was also an associate of O'Leary's, was bombed on July 9, 1907. Two weeks later on July 25, Tennes' home on Belden Ave. (pictured above) was bombed, creating a gaping hole in the alley behind the house. A month later, O'Leary's resort on S. Halsted was bombed, and on August 19, the Tennes home was again victimized. This time, the bomb landed in the front yard, blowing out all the windows of the house, plus those of his neighbors, several of whom announced plans to move away. Tennes himself sent his wife and children to live out in the country for the next few months. The Chicago dynamiters who blew up gambling places for blackmail did business under the name “Smith & Jones”. That is, when they wanted a gambler to put them in the payroll the gambler would receive a mysterious telephone call telling him to see Smith & Jones. The gamblers all knew what that meant and that they would be dynamited if they did not see Smith & Jones. The police never offered any evidence of such a scheme, and were never able to arrest Smith or Jones. A more likely cause for the bombings was Mont Tennes' attempts to monopolize the flow of race information into the city. At the beginning of 1907, Tennes was paying $300 each day to the Payne News Service of Cincinnati, which telegraphed race information from throughout the U.S. and Canada to Tennes' Chicago clearinghouse, which was then in suburban Forest Park, which then conveyed the information to subscribers in the city by secret telephone lines known only to the Chicago Telephone Company. The Payne service had taken control over the race wires after the Western Union company had ceased the business in 1904 under pressure from an anti-gambling shareholder. Tennes disliked paying such high prices to Payne, and the final straw took place in 1907 when an error in odds reporting by the service on a horse named Grenesque at Fort Erie ended up costing him thousands of dollars. He decided to start his own rival wire service and to drive Payne out of business nationwide. Tennes hired agents to attend races throughout the country, who would report back to an operator nearby with a telegraph key. Often race track operators wanted nothing to do with Tennes' agents, and removed them from the premises. In such cases, Tennes' men found their way onto the tops of nearby buildings and used telescopes to observe action on the turf. In one interesting case where the racing action couldn't be seen from any nearby building, a woman was sent into the track to observe; she would periodically excuse herself from the action to a spot where she could be seen applying makeup, touching her nose, eyes, and ears in a specified order that indicated the winners of the race to a telegraph operator observing her nearby. Tennes insisted that all Chicago handbooks use his new General News Bureau service and discontinue any subscription to Payne. Those that refused were either bombed or raided by police friendly to Tennes. Tennes also took the fight against Payne beyond Chicago. He sold his sporting news services in cities across the country, including San Francisco, San Antonio, Cleveland, Oklahoma City, Detroit, and New Orleans. Finally, the Kentucky home of John A. Payne, proprietor of the Payne News Service, was bombed, and the latter gave in, selling out his interest to the Tennes' General News Bureau in 1909, when the flow of bombs in the Gamblers' War finally slowed. In 1911, Mont Tennes again came to public notice when he was sued by a former gambler-turned-reformer named Harry Brolaski, and a disgruntled General News Bureau business partner, Tim Murphy. Allegations that Tennes was at the head of a national gambling syndicate with 800 clients nationwide and $500,000 per day in revenue inflamed public opinion, and in September of that year, the Tribune published a scathing editorial accusing the chief of police, John McWeeny, of accepting graft. When the paper's reporters confronted McWeeny the next day, the Chief was nonchalant. After reading a copy of the editorial given him by the reporters, he was dismissive. “Let them fight it out among themselves,” the chief said calmly. “Who is the complainant against them?” the chief said bluntly. McWeeny insisted, disingenously, "There is no gambling in Chicago and the police do not 'tip off' raids," despite the obvious fact that handbooks were rampant in the city, and the police did tip off their raids in return for Tennes' payoffs. The matter finally ended when Tennes paid off Tim Murphy as well, and the latter wrote letters to the court and the attorneys general of three states swearing off his earlier charges. Mont Tennes continued to monopolize racing information in Chicago and throughout the country for the next decade. Though the handbooks he operated were constantly raided and he served as a political punching-bag for every mayor and congressman seeking the law-and-order vote, he never served a day in prison, always hiding behind a defense that he was simply a newspaper man, conveying sports information around the country. In 1916, Federal appeals court judge and future baseball commissioner Kennesaw Mountain Landis even launched a personal investigation of Tennes' operations, in which it was revealed that his operations netted $75,000 each year, of which 90% went to Mont Tennes personally. Tennes hired superstar attorney Clarence Darrow (of "Scopes Monkey Trial" fame), and eventually Landis' inquiry ended with the conclusion that interstate transmission of gambling information wasn't illegal under federal statues, and actual gambling was a local phenomenon and so not under a federal court's jurisdiction. One of the few times Mont Tennes lost a substantial bet was during the famous 1919 "Black Sox" scandal, in which Chicago White Sox players allegedly threw the World Series in league with a group of New York gamblers. Tennes later claimed he knew the fix was in, but put up $80,000 on his home team anyway. As a Northsider, Tennes really should have only bet on the Cubs. When reformer "Decent" William Dever was elected Mayor of Chicago in 1924, a 51 year-old Tennes decided to get out of the business of operating handbooks and focus exclusively on his news service. A few years later, noting the violent tendencies of Al Capone and other Chicago gangsters, who increasingly were expressing interest in the sporting news business, Tennes sold the General News Bureau in 1927, with a 50% interest going to media mogul Moe Annenberg, founder of the Daily Racing Form. In retirement, Mont Tennes devoted himself to his progeny, his golf, and his charity work. When he died on August 6, 1941, his heirs received a $5 million estate which provided for a $2,000 monthly lifetime income for his wife, Ida, $700 monthly to each of his four children, and $200 monthly for each grandchild. One of the Tennes boys, Ray, ran a Ford dealership, while another, Horace, became a champion motorboat racer. He also established a $1,000,000 trust fund, which donated to Roman Catholic, Jewish, and Masonic charities, and ordered $10,000 annually to support a new "character home" for wayward boys, Camp Honor. The General News Bureau was run by Moe Annenberg together with a Capone associate, James Ragen, until the latter went to prison in 1939 (Ragen was murdered by Capone hitmen in 1946). Afterwards, the Bureau was reorganized and rechristened as the Continental Press Service, and eventually passed into the control of Moe's son Walter Annenberg, who used the money from his news empire, which included Continental Press, to fund journalism schools at the University of Southern California and the University of Pennsylvania. Tennes' mansion at 632 W. Belden, which was built in 1885, still stands today. I married the grandson of John Lewis Smith who at one point in time represented Mont Tennes. Could you give me more information since everyone who would know more information is dead. Follow our trades today & earn up to 270% daily.